Do you want to reveal your family members or ancestors as unique human beings rather than the sum of lifeless facts often found in family history biographical profiles? One way you can write a family member or ancestor to life is to write a biographical essay. The purpose of writing a biographical essay is to develop a main idea or a point about a person. Think of yourself as a journalist writing a feature piece on an interesting person rather than a family historian writing a biographical profile. For example, as this blog series continues, I model how I plan a biographical essay about my maternal grandfather, Otho H. Pollock, during a specific time frame in his life. I want to explore who he was as a horseman and a person during his early adulthood from the late 1910’s to the early 1930’s. 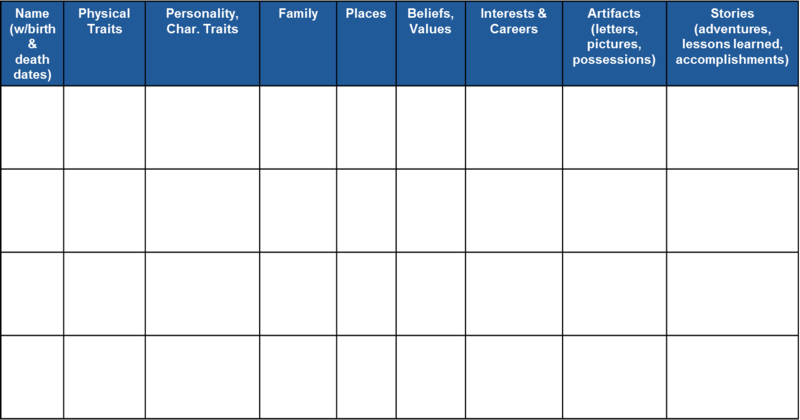 If you are organizing your piece around the concept of a similar personality trait several people in your family have shared throughout generations, consider writing a collective biographical essay. For example, you could write a collective biography of the adventurous military people in your family history, present the practical jokers in your family across several generations, or show how a family motto supports family members in tough times. Many of you interested in writing about your family members and ancestors keep a mental short list of family “characters” you want to explore through writing. So, how do you narrow your list down to one when you want to start writing today? First, put those names of the people on your short list of subjects into a brainstorming chart like the one below. Then, generate as many details as you can as fast as you can. Put yourself on a timer and try to keep it under 15 minutes. You don’t need to fill out every box, just fill out what you can in the fifteen minutes. Resist turning this into a research exercise. When you complete your brainstorming chart, one person should stand out to you as the one you are most motivated to write about first. • Which person seems more interesting or exciting to you personally? What do you know about that person? And, more importantly, what do you want to learn about that person that you don’t know? • Which person’s life experiences connect in some way with his or her family members or descendants living now? • Which two people interest you the most? If you still aren’t sure which person to choose, skip to Step 2 below anyway. Instead of narrowing your focus for one person, complete a brainstorm for each. At this point, one should emerge as the most exciting or the most feasible. This time, we recommend using another brainstorming strategy to generate content. 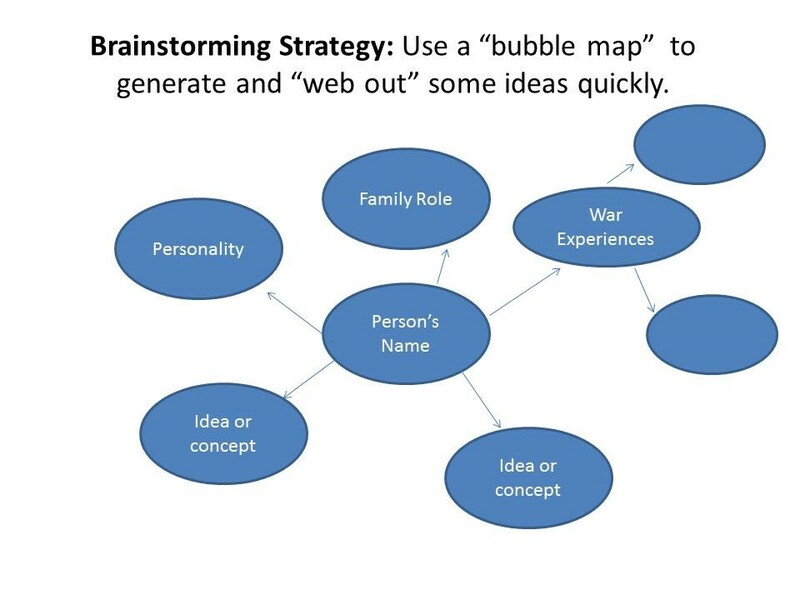 Two useful brainstorming strategies you can use to dig into your chosen topic include bubble mapping (sometimes called “webbing”) and focused free writing. Create a bubble map by placing the name of your subject in a circle in the middle of the paper or use an online mind mapping application. Then, begin brainstorming key categories or features of your subject in “bubbles” connected to the central bubble. After you have established several general features, categories or ideas, go back and connect new, more specific detailed bubbles to your more general bubbles. For example, if I were thinking about exploring my father’s experiences in the Cold War and Vietnam, I would continue to branch off “War Experiences” with specific stories, quotes, events, and research I know offhand. Keep in mind there is no right way to “web out” what you know or want to know. Over-thinking is counterproductive in these early brainstorming stages, so do not belabor the effort or hold back – set a ten-minute timer and let your pen fly. To brainstorm ideas for my grandfather’s essay, I began with general topics, features, and categories of information. Then I began adding specifics I’d learned about my grandfather from family members, artifacts, documents, and research over the years. 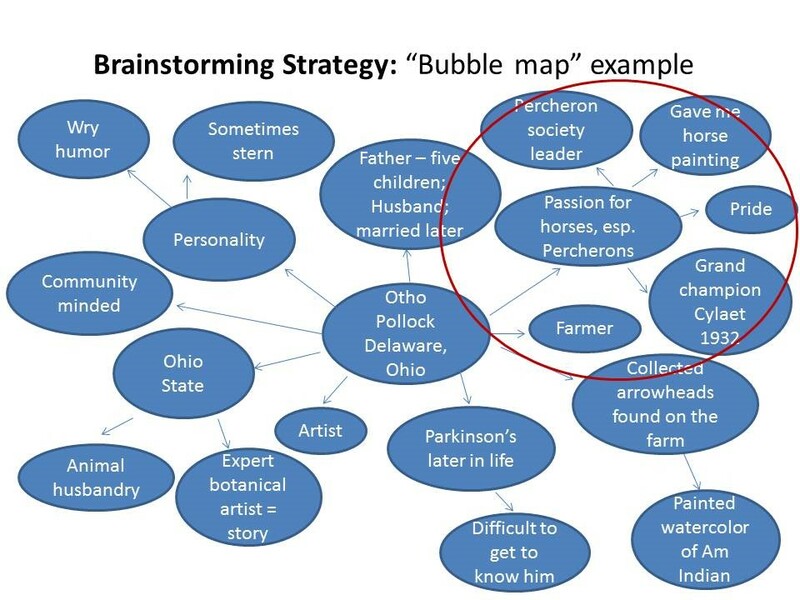 If the bubble map brainstorm doesn’t result in a narrowed essay topic you’re excited about or you just want to dig into your idea further, try focused free writing. When you free write, your pen follows your thoughts about your subject without regard to organization, grammar, spelling, punctuation, or stylistic quality. Free writing can help you access what you really think — or feel — about a topic or a person. Free writing unlocks your creativity, releases your inhibition, and gives you access to your deeper thoughts. One of my favorite writer quotes of all time is English novelist E.M. Forster’s “How do I know what I think until I see what I say?” Free writing is one of the best ways to find out what you think. To begin, grab a sheet of paper or sit down at your computer, write the name of your subject on top, and start writing in prose format (sentences). Don’t list or bullet point. Free writing is most productive when you place yourself on a timer. Ten to fifteen minutes is enough. By the way, any time you are “stuck” in your writing process, free writing can help you break through the block. In the web above, I circled the topic that interested me most. Now, I need to consider my readers’ interests. My grandfather was a practical man, a person whom you might describe as “salt of the earth.” Most people in our extended family already know this. However, his exceptional passion for Percherons was a motivating personal, social, and business force in his young adult life. We do not know as much about these years. 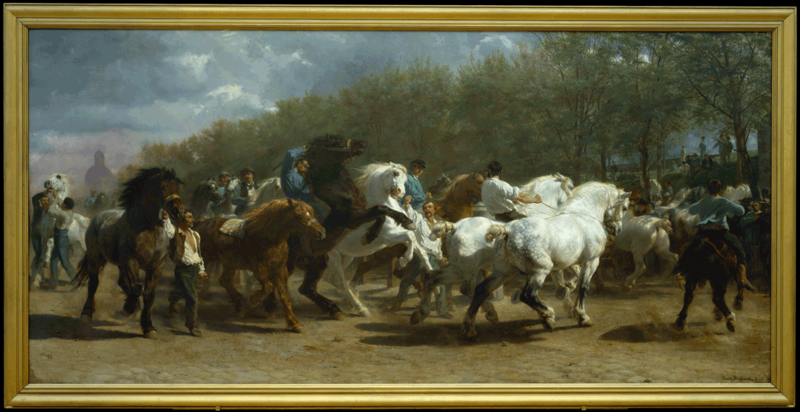 Thus, my purpose in writing this essay is to present an interesting and accurate look into Otho Pollock’s early adulthood and his life as a Percheron evangelist for my mother as well as current and future generations of horse lovers in our family. I know I will put more heart into a piece I write for my mother, sister, my sister’s children, and their children. In Ohio and throughout the Midwest before the advent of the modern farm equipment, farmers used Percherons as draft horses. Knowing my purpose and picturing my intended audience while I write will give energy and meaning to my biographical essay. Now that you have narrowed your topical focus and visualized your audience, you are ready to assess your resources and further research needs. Read the second post in our series: Family History Biographical Essay, Part 2: “Identify Your Resources and Research Questions. This website is amazing—easy to understand, helpful in getting started, and pleasing to the eye. The creators have thought of everything and keep their users in mind at every turn. This is user friendly and will help any writer get closer to the goal—which may be writing family history, personal essay or memoir, or perhaps jumpstart a historical novel. Bravo!